Terry faces off against the black GT Robot, while Coco fights the giant robot. Coco has a hard time at first, his poison attacks do little against the inanimate robot at first, but eventually he is able to overcome his foe. Sunny faces his own enemy, defeating him, before being expelled from the Mammoth’s body. 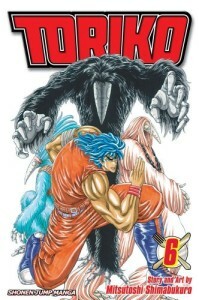 Toriko, Rin, and Komatsu go deeper into the Mammoth’s body, searching for the Jewel Meat. The run into the black robot, Rin is mortally wounded, and Toriko beaten. The robot knocks him through the wall, where Toriko finds the Jewel Meat. The taste of the meat reinvigorates his Gourmet Cells, and Toriko is able to defeat the black robot, whose operator identifies himself as Starjun. I’m surprised at how quickly this arc is coming to an end. Despite having three different battles, all three finish within this single volume. I’m a fan of the condensed shonen epic Toriko has been. Long drawn out fights are all good and fine, but there’s no need to go too far. If the climax of an arc can fit in a single volume, then the creator is doing something very right in my opinion. Remember how last week I said I was skeeved out by them being inside the mammoth? Well take that and multiply it many-fold, because this time we get to see them cut pieces off the walls and eat them. Just…gah! I’m all for medium to rare meat, but don’t just go eating it raw, especially when you’re inside the animal you’re eating! My own personal squeamishness aside, this volume had a lot going for it. From Coco’s creative fight, with his versatile use of poison, to Sunny’s personal style that matches Toriko’s for brute strength. Toriko learns a new power, autophagy, where he fuels himself with his own mass. I try not to think about this one too much, it would just make me feel queasy. Moving away from things that make me queasy, I really, really, really want to eat the Jewel Meat. Mainly because in theory a meat that tastes like all the meats would be delicious, but I can’t help but doubt that the conflicting flavors and textures wouldn’t be a trainwreck. But if it is as delicious as Toriko makes it seem, then sign me up! In the end this was a nicely condensed, perfectly silly, with an odd air of gravitas, of a manga volume. The climax of an arc is meant to be the most exciting part of a manga, and I could see myself reading this volume more than once. Highly recommended.